Background Since writing some notes, a while back, on improving dynamic range ( HDR: In search of High-er Dynamic Range ) and ( In Search of Spectrometer Attenuators ) two nagging issues have remained. 1) How to avoid adding out-board attenuation to gain more data and 2) How to eliminate, or at least reduce, the difficulty of setting the intensity just below clipping for RGB channel data. I think I've now found a simple approach to both problems and I believe this could be implemented in Spectral WorkBench. Maybe as a Gsoc project? Notice the clear improvement in detail by extracting more information from the full spectral band image. The (BLACK) HDR2 plot clearly shows the additional detail which SWB presently throws away. 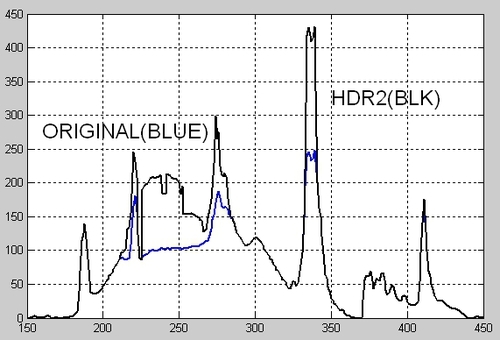 Notice that the HDR2 algorithm does not alter the non-clipped data so there is no added error for weaker signal data. Comparison Below is a sample result; extracted from a 'typical' CFL spectrum using the PLabs hardware approach (although I just captured the whole 640x480 image). The LEFT plot shows the typical RGB+Grey (Grey = the expected output spectral response) with both the Blue and Green channels clipped. The RIGHT plot shows the (now extracted) missing data for those clipped regions. The LEFT plot shows that the RGB data is 8-bit limited (0-255 range) but the RIGHT plot has no such limit. Clipping now works to advantage instead of something to entirely avoid. If the original spectral image has been retained, then the additional data can still be extracted to update older spectral plots. Yes, the calculated values will have some error but I believe that error is small relative to the improvement in a) small signal detail and b) clipping compensation. Yes, this graph was generated from some hackware in matlab to test the theory so the algorithm could likely be improved. Yes, clearly there are limits to how much over-exposure can be allowed and still trust the calculated fill-in for the clipped data. I'm guessing that this technique could be incorporated into SWB code. Ok, so how's it done? Below is what many think of as the spectrum band from their PLab Spectrometer as they watch and adjust in Spectral WorkBench. That band is created as a time-sequence of a single line of pixel data as it is captured over and over. It is a nice tool for making sure the data. NO, Not this spectral 'band'. However, that is not the 'spectral band' I'm referring to. I'm talking about the 'band' of color as it appears in the original camera frame image. Instead, imagine collecting not just one 'line' of pixels, but ALL of the pixel lines within the displayed spectrum. 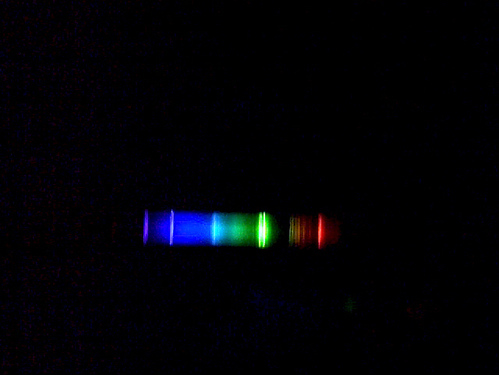 Notice that the spectra is generally bright in the center and fades above and below. 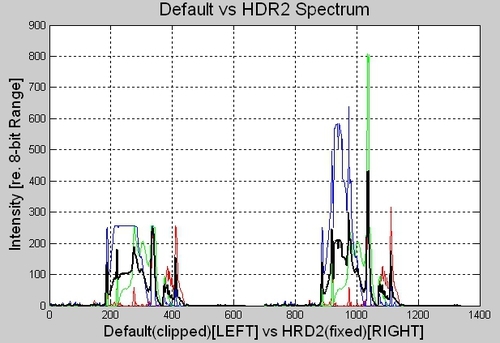 This is because the system (slit, CD and lens) attenuate the signal -- so use this 'built-in' attenuation to perform an 'HDR' type function. For example, consider the intensity profile of just one 'vertical' line of green pixel data in a bright green band. It will be 'weak' at either end ('top' and 'bottom') and 'strong' in the middle where it can easily be too bright and 'clip' the green signal data. Before, clipping was a bad thing, now, it is necessary so as to bring 'up' the weaker signals out of the noise; thus improving dynamic range. Intensity Profile Below is the averaged RGB intensity profiles which graphically describes the attenuation, from top to bottom, of the spectral band. The 'peak' of this curve is the center 'bright-spot'; typical location chosen for generating the SWB plots. Now you can see the importance of generating this profile. Since the intensity data is linear, then even if the signal does 'clip' at it's brightest point, it will not clip when attenuated (at that same wavelength). That attenuation profile can be extracted by reading data from the entire spectral image band. This profile can then be used to calculated what the signal intensity must be even though the measured data (when clipped) cannot display it. That correction is used to 're-write' the original RGB data in the 'clipped' regions and the corrected RGB data is then used to generate a new final spectrum plot which has improved dynamic range. Yes, the above algorithm is a bit 'brute-force' and could likely be improved but it works well enough for proof of concept as a starting point. Finally, as with any research, there is the potential for missing issues and details so I welcome observations and comments.